Written by Isabella Anderson As part of my Costa Rica vacations, I want to go to every beach that I can find in Guanacaste. From the northern beaches such as Tamarindo, Hermosa,Panama, to the southern beaches in the Nicoya Peninsula, I’m taking the time to visit every place that I can. It’s a hard task, but someone has to step in for it! 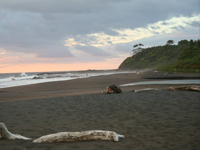 If you are planning a Costa Rica travel, my experiences could help you in your quest for the perfect Costa Rica tour. Some of the most beautiful beaches in Guanacaste are located in the southern Peninsula, 2 hours from Liberia, and stand out for its natural beauty and not being as crowded as the most popular beaches like Flamingo and Hermosa Beach. This area has a lot of well-known beaches, like Samara, Nosara and Montezuma. However, there are also small beaches, some very well hidden or with difficult access. Those places will reward you with an amazing natural beauty, absolute quietness, and the feeling of being one of the few to reach them. Azul Beach is one of those special spots. To get to Azul Beach (Blue Beach), you will need to drive from Samara to Nosara, approximately 23 miles, going thru Guiones and Ostional and finally Azul. The trip from San José takes around 6 hours, and you can drive from Liberia if you land at the Liberia International Airport. You could also take a bus to Nosara and take a cab to the beach, which is a 40 minute ride. Just consider that getting a cab in Azul is almost impossible, so book the round trip in advance. You could also fly to the Nosara Airstrip and drive from there. If you rent a car, use a 4x4, since the access to Azul is not paved. What will you find in Azul? A lonely beautiful beach with warm, clear water, and brown sand. The dry forest and the ocean dominate the landscape. It’s the perfect Costa Rica getaway, a great place to relax and escape from everything.